We're happy to provide you with financing and leasing offers that are tailored to your needs and requirements, at excellent rates, terms and conditions. 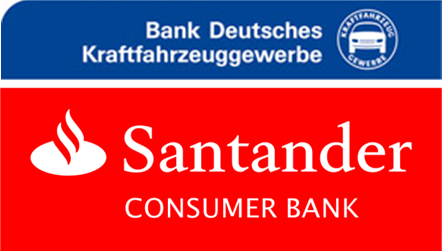 Our financing partners are Santander Consumer Bank and BDK Bank Deutsches Kraftfahrzeuggewerbe (German Federation for Motor Trades and Repairs Bank). Please contact us directly for an individual, non-binding offer.